The Hilton Grand Vacations Club @ Waikoloa Beach Resort is a spectacular new hotel on the Big Island of Hawaii and is designed to be an ideal Hawaiian haven in the heart of Waikoloa.Superbly situated adjacent to championship golf courses, the premier location of the newest Hilton Grand Vacation Club resort provides an unsurpassed vacation setting. 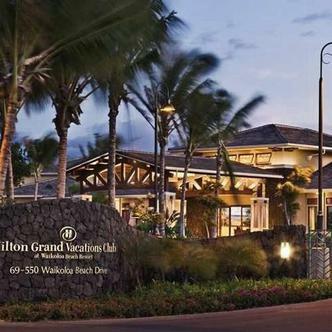 Hotel guests have access to the abundant facilities and amenities of the nearby Waikoloa Beach Resort and the Hilton Waikoloa Village hotel, including an enticing array of restaurants, boutiques, beaches and water recreation. Complimentary shuttle service is available between the Hilton Grand Vacations Club @ Waikoloa Beach Resort, the Hilton Waikoloa Village, and area shops (7:00am-9:30pm, every half hour subject to changes).Hawaii visitors staying at our Waikoloa Beach Resort will enjoy spacious two-bedroom suites which incorporate a casually elegant tropical style, and feature a superb variety of upscale amenities and furnishings.Travel should take you places.